Investigation of laser matter interactions using high power tuneable ultrafast Ytterbium fibre lasers. Manufacturing lasers are a source of some £6Bn of revenue for UK industry. However, they are a enabler technology for over £1Tr of industry globally. Laser manufacturing is dominated by several laser sources at traditional lasing wavelengths and long-pulse interactions. 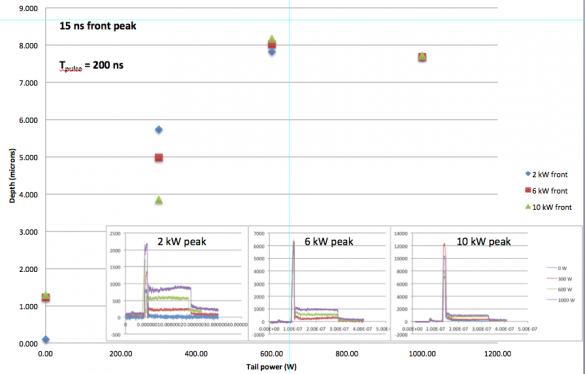 Industrial processes have been optimized using these available laser sources, but relatively little work has been undertaken to optimize the laser parameters to the process. In this project we aim to break beyond the bounds of current laser technology and investigate the performance of novel laser sources developed by a well established consortium of academics and industrial partners, Optoelectronics Research Centre, University of Southampton, and SPI Lasers. Tuned in wavelength and pulse shape to optimize process efficiencies, this second generation, wavelength-agile, tuneable high power fibre laser technology will change the landscape of materials processing, creating a quantum leap in process capability and further increase the impact of laser based manufacturing. 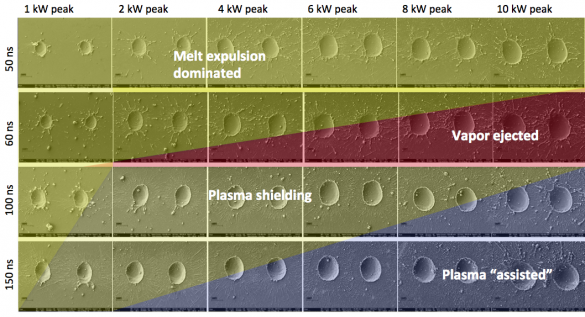 We investigate the performance of a number of β-type fiber laser designs by developing and implementing a range of laser matter interaction experiments and associated diagnostic techniques. This, alongside a deep understanding of Industrial requirements, is expected to lead to truly novel laser designs for commercial applications. Previous work has shown that a including a front peak in the pulse envelope produces a favorable material response in Silicon by increasing the absorption coefficient to which the remainder of the pulse tail can couple. Many laser systems use this effect to their advantage by including shaped pulses to process Silicon. Although effective, many temporal profiles are not optimised to the material response. In particular, in the nanosecond regime at which thermal and structural events dominate, are of particular interest to micro processing of monolithic materials. Material processing using nanosecond systems with power densities of >1011 Wcm-2 introduces a phase object at the point of interaction, the dynamics of which last over 1000 ns. This is usually well within the temporal window of the pulse. The induced plasma and shock wave fronts interact strongly with the processing beam affecting the quality and efficiency of the ablation process. 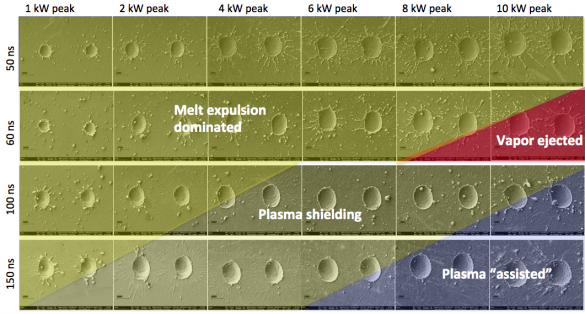 Although nanosecond interaction regimes are well understood for a range of materials, picosecond interactions allow for greater energy deposition control to the work piece. The picosecond regime is interesting because it is within the temporal range of a number of material set limits such as thermal diffusion times and oxidation reactions, meaning that we are working on the limit of the speed of natural processes. Some preliminary results for picosecond interactions are shown below for Silicon and SS304 Steel. What are the characteristics of the generated plasma "optic"
What effect does the generated plasma have on subsequent pulses? Is it possible to mitigate the effect of plasma lensing using temporal pulse shaping? 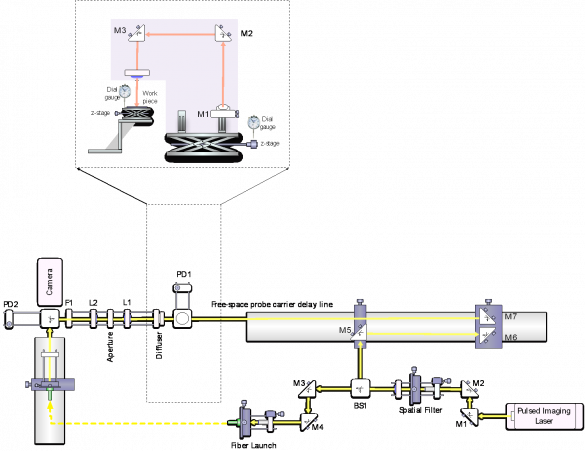 The figure below shows our Ultrafast Digital Holographic system for exploring light-matter process dynamics including determining energy deposition efficiencies. Real world applications are often performed at multi kHz pulse rates. 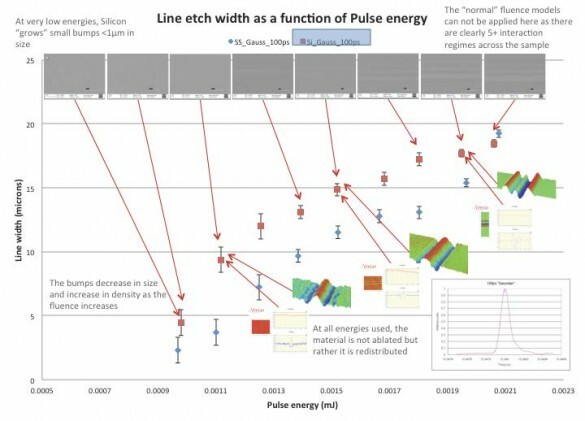 It is clear that long pulses (typically longer than a few nanoseconds) or subsequent pulses are subject to plasma shielding, defocusing and material ejection. The figure below shows the dynamics of a 0.25 mJ Gaussian pulse on Silicon. 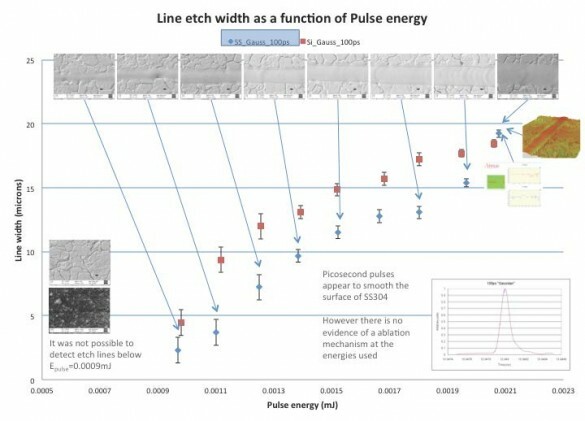 Given the flexibility of modern fiber and disk lasers to be driven at very high frequencies, and the ability for laser system designers to deliver “designer” pulse shapes, we hope that this work will inspire commercial laser designers to look closely at the application needs and work from a material-centric and process-centric perspective to define the laser and process interaction parameter space by exploring energy deposition regimes for light-matter interactions in the nanosecond timescale. Acknowledgements - The project team would like to thank the EPSRC and the UK TSB SMART Laser Project for funding and support.